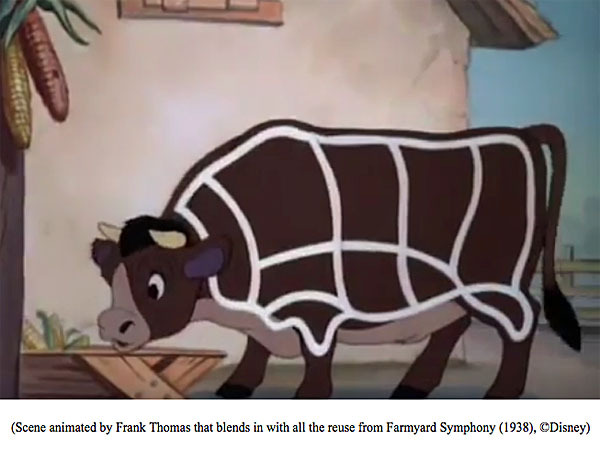 Back in 2015, my colleague J.B. Kaufman provided this website with a great overview on Disney’s first ‘Good Neighbor’ agricultural educational film. I thought I’d take a closer look and a deeper dive on this subject in today’s column. 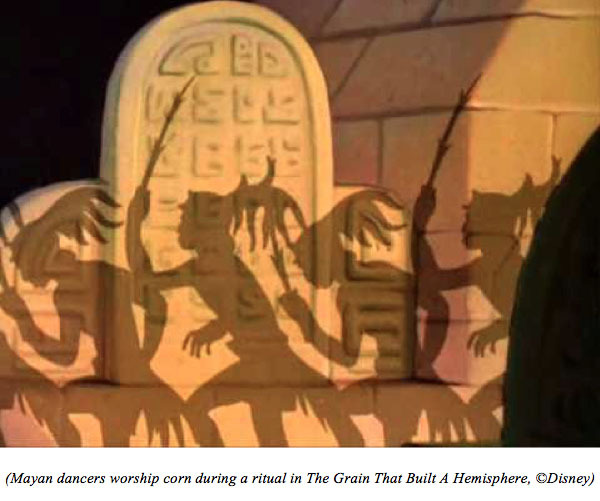 Of all the animated productions from the Disney Studios produced during the WWII period, The Grain That Built A Hemisphere is by far one of the oddest. Other Disney war effort films encouraged people to pay their taxes or celebrated the American farmer’s efforts, The Grain That Built A Hemisphere celebrates corn, which according to the film “…is a symbol of a spirit that links the Americas in a common bond of union and solidarity.” The film was made as part of the ongoing efforts by the U.S. Government to bolster relations with Latin America during the war. Commissioned by the Coordinator of Inter-American Affairs (CIAA), The Grain That Built A Hemisphere was as much an educational film on breeding and growing corn as it was a history lesson on the development of corn across the Americas. In watching the film, it is a stretch by any measure to use corn as a way to “link” the Americas, after all the U.S. is neighbors with Latin America and that is enough of a bond. The CIAA was created “…to (1) coordinate activities of Government and private agencies in Latin America, (2) recommend programs to other Government agencies to supplement existing programs where needed, and (3) direct operations of programs in the event no other agency was in position to do so.” (see footnote 1) Strengthening the ties with the United States’ Latin American neighbors was in the countries best interest especially since raw materials such as tin, rubber, and other natural resources were produced in many of those countries and were essential to the war effort. Making health and agriculture related films were designed to not only improve relations but also to help insure the good health of the residents of those countries, especially the workers in those industries. 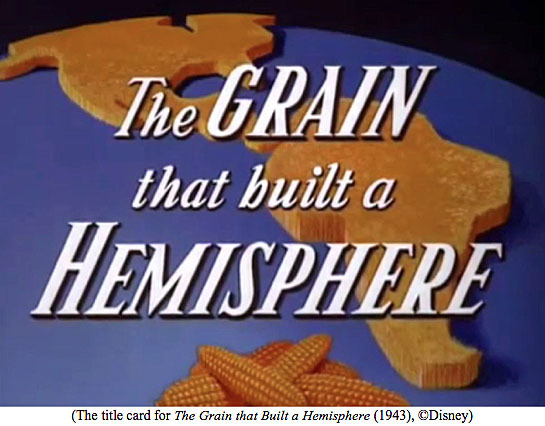 The Grain That Built A Hemisphere was the first of the agriculture films to be completed under a contract between Disney and the CIAA for five health related and five agriculture related films. The film was originally titled Corn and Corn Products, but the title was changed before the film was released. The new title, The Grain That Built A Hemisphere, was more appropriate and related better to the Good Neighbor policy. Walt Disney assigned the project to directors Bill Roberts and Bill Justice, two trusted veteran artists of the Disney Studios. The film has three main sections with the opening sequence of the film focused on the evolution of corn in the Americas. The narrator says, “…the exact ancestry of corn is a matter of doubt. Corn as we know it today could not have existed in the wild.” The narration goes onto explain the two possible ways that corned developed using mostly still artwork coupled with camera moves and dissolves between various pieces of art. Some scientists believe that modern corn originated from Teosinte, which looks like a weedy grass. An ear of teosinte contains about five to twelve kernels encased in a tough, tight husk. The film shows still artwork depicting this plant and the attributes of the kernels. The animation shows the Indians migrating then dissolves to the Indian resorting to eating roots as a source of food, which was not enough to sustain him. The Indian then discovers the “waving tassels of grain drew his eye” as the music swells triumphantly. Much of the animation of the indigenous people was created by Vladimir “Bill” Tytla best known for his Grumpy animation in Snow White and the Seven Dwarfs, Stromboli in Pinocchio and for the Chernabog character in Night on Bald Mountain sequence in Fantasia. His animation in The Grain That Built A Hemisphere, although simpler, has technical strength imbued with an artistic elegance that shows his command for animating human characters. Through the discovery of corn, the Indians were able to solve their food scarcity problem. “So, through his discovery of corn, the civilization of the Americas began,” as the animation shows the Indian begin to plant corn, growing their own crops. Through a series of cross-dissolves, the animation shows the rituals surrounding corn and the growth of the Mayan civilization, then the Aztecs and the Incas. The Incas further developed corn with kernels three times the size of the wide corn and corn spread throughout the Americas eventually spreading throughout the world. The simple animation showing more rituals including offering of human blood to the Gods, the Incas in the Andes mountains and the map of the world is very effective in moving the story along and covering centuries of history. At this point, the film goes into a section that discusses the inbreeding of corn plants to create a pure breed. This is done by fertilizing the silks with pollen from the same plant. Once this has been accomplished, two unrelated inbreed strains are “joined in wedlock” to produce a larger, stronger stalks and an increase yield of corn with better seed corn for bigger crops. Using a pie-chart on screen, the film shows that seventy-five percent of the corn produced in the U.S. is used for feeding livestock, “…cattle, sheep, horses, mules and hogs.” The narration explains the food chain of corn feeding by stating that “…more hogs make more little pigs and more pigs make more little sausages and vice versa.” Disney reached back to the Silly Symphonies short Farmyard Symphony (1938) to reuse a more than thirty-second sequence of animation to show “….corn has what it takes.” The quality of the animation and the use of still artwork with camera moves and cross-dissolves throughout The Grain That Built A Hemisphere ensures that the reuse animation from the earlier short blends seamlessly into the film tying all the animation together with the common Disney house style. And why won’t it with the likes of Tytla doing much of the animation and additional animation from two of Walt’s Nine Old Men, Frank Thomas and Milt Kahl. Thomas animated the one scene in the sequence not from Farmyard Symphony. It is of a steer that increases in size and the outline of a diagram of the various cuts of meat dissolves onto its side to the surprise of the steer itself. Animated in the style as that short, it flawlessly blends in with the rest of the reused animation. The last grain related topic the film touches on is the many products that the chemist has discovered and developed from corn. On screen is a hand holding up a test tube with an orangish liquid that cuts to a profile of a large kernel. The kernel dissolves to an x-ray view of the two main parts, the endosperm and the germ. The germ is “…from which oil is extracted furnishing salad oil for your table, cooking oil for your kitchen. From the endosperm, the chief product is starch.” There are a series of animations depicting products that use starch like ice cream, pudding, pies and starch that is used for shirts, seizing for textiles, paste and “…mucilage for postage stamps.” The imagery and narration go onto to describe how from starch comes glucose “…a rich golden syrup for cornbread, griddlecakes, jams, preserves. In surgery, glucose replaces sugars lost from the blood. Starch makes sugar, the sweet-tooth of the corn— quick energy as candy. It’s the body and flavor of your soft drink, the boost in your beer.” Effects Animator George Rowley is credited with much of the animation throughout the sequence. The final sequence of animation is a montage of scenes some of it repurposed from the Donald Duck short The New Spirit, which had been completed the year before for the U.S. Treasury Department extolling the virtues of paying your income taxes. As the music swells, the sequence dissolves to the ancient, primeval landscape with the wild corn plant as the narrator says, “…it’s a far cry from those primitive days when the waving grain attracted the roving hunter. Little did he realize the score of riches they contained. A botanist called it zea maze—that which sustains the Maya. How much more truly might we say today, that which sustains the world.” Then, with a musical crescendo, the screen image of a kneeling Indian rolling corn on a stone with a stylized image of North and South America in the background fades to black and a THE END title card comes on over a line drawing of a shielded eagle. The music is credited to Edward H. Plumb, who was the musical director for Fantasia and wrote the score to Bambi. 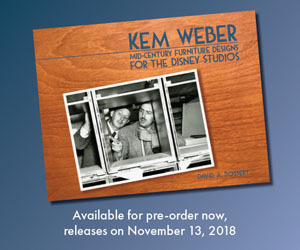 He received an Academy Award nomination for his Bambi score and his scores were nominated for Victory Through Air Power, Saludos Amigos and The Three Caballeros. 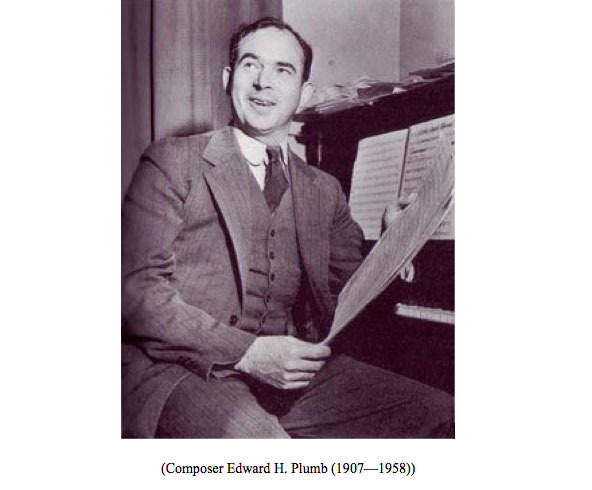 Plumb was also a noted for orchestrating Dumbo, Make Mine Music, Song of the South, So Dear to My Heart, Cinderella, Peter Pan and Lady and the Tramp among many other works for Disney including some of the True Life Adventures and Wonderful World of Disney shows. He had a prolific yet short career dying at age fifty. What is wonderful about his score for The Grain That Built A Hemisphere is that he took as much care in creating a mood and tone for this short documentary as he did in composing the score for any one of the feature films. The running time of the film is eleven-minutes, a very full one reel. The initial concept for the film was much more ambitious with Leo Thiele, the writer assigned, conceiving it as nearly twenty minutes, two reels, which is more like a featurette than a short. Although the CIAA liked the storyline for the film, they pushed back at the studio on the cost, which Disney agreed to reduce by shortening the film to one reel. Even at that, the film was still two to three minutes longer than the standard Disney short at that time. The film was finished and delivered to the studio on January 4th, 1943 and was qualified (and nominated) for an Academy Award for Best Documentary. Corny or not, The Grain That Built A Hemisphere is one of the more odd films Disney created for the war effort but it is also one that has held up over time. It is an educational film that, with the exception for some of the war effort imagery in the last minute or so of the film, could be shown in any biology or history class today. It is a further example of Walt’s ability to expand the role animation into new areas that helped lay the foundation for the production of many more educational films long after the war ended. Accurate for the most part, but the indigenous peoples of the Americas did not use bows and arrows before European colonization; much like horses, that would appear long after the cultivation of maize. One interesting fact missing here is the Precolumbians knew to treat maize with alkali to make them of actual nutritional worth, otherwise all the protein just passes through the human digestive tract unused. Europeans both in the American colonies and the homeland did not know this which lead to the rise of pellagra. Pellagra, incidentally, is hypothesized to have lead to the vampire myth. Didn’t Edward Plumb do the music for the Tom and Jerry cartoon “The Missing Mouse” in place of Scott Bradley? Yes. Though frankly, if you didn’t look at the credits beforehand, you would be forgiven for thinking it was by Scott Bradley as usual. I wonder why Bradley was unavailable to score “Missing Mouse.” Maybe he was busy elsewhere, as he did score a few feature films.